The idea of a rock star videogame director has largely fallen by the wayside over the years. There are still names out there that are worthy of the attention, but not nearly as many as there were in the mid-00’s and earlier. One of these names is that of Goichi Suda, AKA Suda51. The outspoken writer/director has created some of the most unique and interesting titles over his career. After largely focusing on producing in recent years, he has finally returned to the director’s chair for Travis Strikes Again: No More Heroes. Travis Touchdown, former top assassin in the United Assassins Association, has decided it is best to live a simpler life. Untethered to his former occupation, the brash otaku now spends his days holed up in a camper playing videogames. However, the past never forgets, and former baseball player Badman is a testament to that. Seeking revenge on Travis for the murder of his daughter, Badman tracks him down to battle. However, the clash is interrupted, as the duo find themselves being sucked into the mysterious Death Drive MK-II console. Now the two must battle their way through a series of increasingly absurd games on the console, with the winner being granted a single wish. If you’re at all familiar with Suda51’s work, you know that things tend to go off the rails with his tales. And that reputation holds true in Travis Strikes Again, which often goes to weirder and more absurd places than you would ever expect. Even how the story is told is off-beat. While certain moments are relayed during the actual gameplay segments, most of the plot is relegated to the in-game visual novel Travis Strikes Back. There we follow Travis as he searches for the remaining Death Balls necessary to continue his quest. It’s through these segments that the anarchic, fourth-wall shattering spirit of the title really shines through. As humorous as the story can be at times, though, it can be hard to parse exactly what’s happening. While I like most of what I’ve played of Suda’s output, I’m not exactly a superfan. So diving into the plot, which is a seemingly endless series of references and jokes to the bizarre universe he has created over the years, is an often confusing experience. I got, and enjoyed, what I could out of the experience. However, for the uninitiated, trying to diligently follow what the heck is going on can be as challenging as deciphering hieroglyphics. I look forward to reading theories across the deepest parts of the internet, though. While an offbeat personality has been the calling card for Grasshopper Manufacture, they’ve typically backed up their attitude with strong gameplay. Which is why I’m so confused about the poor direction taken for Travis Strikes Again. 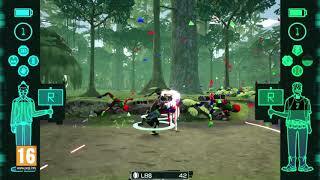 Despite the set-up being there, the vast majority of the gameplay is centered around a standard, top-down action game. As either Travis or Badman, you fight off bugs that litter every game the Death Drive MK-II runs. There’s a light attack, heavy attack, roll dodge and skill chips that can be equipped to utilize specials. There are plenty of chips hidden across the game, and figuring out a load-out that maximizes your skills is the key to the combat engine. Admittedly, that’s not the worst set-up for a game, but something really went wrong here, as the gameplay is straight-up bad. The standard strikes lack any sort of combo rhythm, and you’re better off spamming the light attack rather than using the molasses slow heavy strike. The skill chips add some strategy to the combat, but there’s no pizazz to any of it. It’s all so bland and boring that it often feels like a joke. An incredibly tedious game placed in the middle of a uniquely bizarre adventure. Not helping out are the overlong levels, which can extend past the hour mark depending on how much searching you wish to do. Most of them are the same boring set-up of hazards and enemy trap rooms, with little personality to be found. Special shout-out to the last level, which is a slog through rampant, terrible gimmicks. 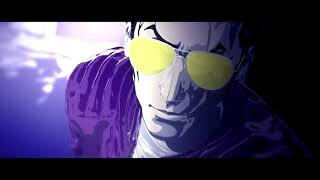 Even the boss battles, which were stand-outs in the other two No More Heroes games, aren’t that memorable. There is one, which I won’t spoil, that was solid, but the rest are disappointing. I just don’t understand why Travis Strikes Again is so beholden to this one, terrible style of gameplay. The set-up of jumping into different videogames should have led to decent variety. Except everything always returns to the same, boring combat. To be fair, the game does try to switch it up at least twice, both to less than desirable results. An awful racing segment is the nadir of the title, and a throwback Asteroids riff shows up later on. You don’t need to beat it to move the story forward, and I didn’t, so I don’t know if there’s more to it than that. Seems like a waste of a level, though. Even the sense of style that Grasshopper games are typically soaked in is kind of missing here. The character design is excellent, I’ll give it that. Both Travis and Badman have memorable looks, and the option to purchase new shirts based around other indie games is cool to see. Each of the bosses are also uniquely stylish, with a familiar face in level 5 and Doppleganger in level 2 being my stand-outs. However, the level design is completely forgettable. Muddy textures and a general lack of variety make exploring each location a chore. I harped on it for being bad before, but the layout of the last level has to be intentionally terrible. That’s the only way something so boring, yet somehow obnoxious, made it into the final product. 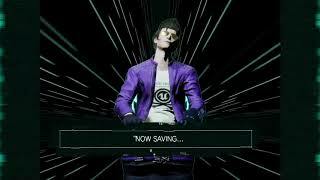 After wrapping up my playthrough of Travis Strikes Again: No More Heroes, I had to wonder: is this all just a big joke? Or was Suda51 more concerned with telling the story he wanted to tell rather than actually making something fun to play? That’s the only explanation that makes sense to me. A title that still manages to ooze personality and humor during its down moments, but is a tedious, bland slog during the action. I’m not ready to give up on the series yet, but as far as comebacks go, it doesn’t get much more disappointing than this. The excellent and memorable character work of Travis Strikes Again is unfortunately offset by boring level design. The DJ Abo and DJ 1-2 OST is excellent, though, and I wish I could stream it outside of the game. Inexplicably dull and monotonous. While the skill chips give the combat some layer of strategy, the beam katana has never been less fun to wield. And when the gameplay does try something different, it somehow feels even worse than the combat. Referential and inside only enough to be detrimental, the story of Travis Strikes Again is still wildly funny at times. Even if I can’t decipher what exactly is going on, it’s certainly memorable. Co-op play is a welcome addition to Travis Strikes Again, but that doesn’t change the fact that the game itself still isn’t really fun to play. Suffering with a friend is at least more palatable. Despite the portable nature of the Switch, No More Heroes feels like it needs to be played on a big screen. The zoomed out camera can make peering into the tiny screen of the system painful. Besides that, the load times aren’t great, with the title taking a surprising amount of time to boot up.